The most auspicious planet in Astrology, Jupiter will enter in Scorpio on 11th October 2018 and stays in this watery sign until November 9th, 2019. We will see how its transit will affect different signs of the zodiac. 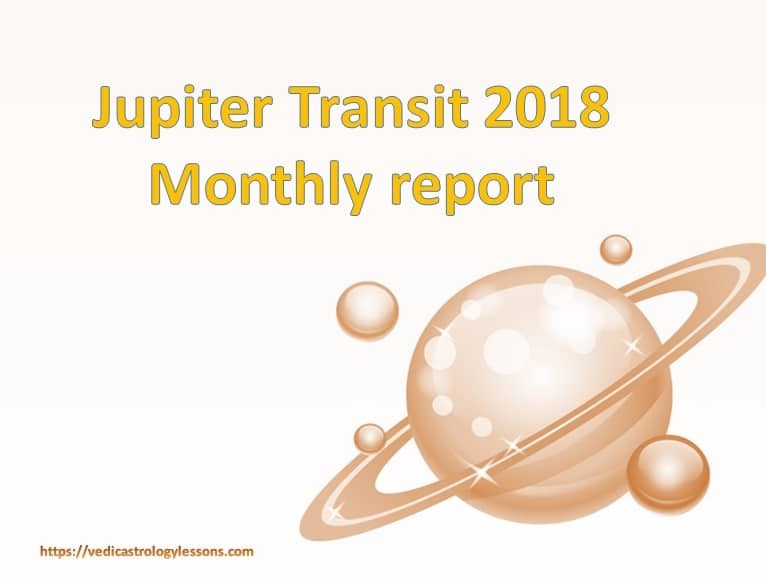 Jupiter will give good results for Aries sign natives in month of October’18. You will spend some romantic and memorable moments with your spouse. It’s quite possible your wives give them gift of a baby, so you will feel very happy and be proud on her. Some auspicious ceremonies will also be organised at your home. You may also get some good news from your workplace. From health front some worries are there, your lion pain may create trouble for them. You may have some discomfort from siblings. Good time for family harmony for Arieseans on the month of December’18. This month will be wetness of your growth in your professional life. You will also be happy with your spouse you both may be spending some precious time with her or him. This is the right time to be more intimate with her or him and short out previous differences. Your parents will feel much more improvements in their health. You may become father of cute boy. Aries sign will have concern about her parent’s health during January’19. Your parent’s may be face sudden problems. You may found yourself trapped in office politics. This month few sudden positive events will also occur. Your marital relationship will be quite good and your spouse will be lucky for you. You will get some monetary gain this month. You may see some tough time during Mach 2019. If you are employed in any company you must feel huge pressure in your office and if you are self employed your will see noncooperation from your employees, they won’t will be unable to fulfill their commitments. You may visit hospital this month. You may face some hurdles in your future planning as they won’t be executing as per your expectations. If you are thinking to purchase a new house, this is best time to get it. Career wise time is a little bit hard. You must have to maintain balance everywhere. You will have good understanding with your wife this month and spend memorable time with her. Your parents’ health will be good. In August’19, God may bless u with a male child. Jupiter will become direct in the first week of this month. Now it will turn a little bit favourable for you. You may for pilgrimage with your family and be spiritual. Your marital life will not be very good during this month. Your spouse will not treat you as per your expectations. You both should be flexible and shouldn’t have unrealistic expectations with each others. Your parents will enjoy fabulous health they will feel themselves lake 25 years old full of energy and enthusiasm. You may meet some new peoples. You may create some close relations with someone. Professionally this month is normal. Siblings will see towards you with hope for your support. You should help them out. You will fell ill during October 2019 because of acute pain in your stomach and you may also hospitalize. You should avoid outside food and try to have homemade simple one without much more spicy ingredients. Your confidence level will remain at lower side. Parent’s health will be fine. Marital harmony will be line previous month. You should take some steps to elevate harmony between both of you. You will see a little improvement in your Professional life. FIFA WORLD CUP 2018 Astrological Prediction – Who can win?